Some of you already know, that I recently found out my tires were 13 years old! This could have been bad, very bad. 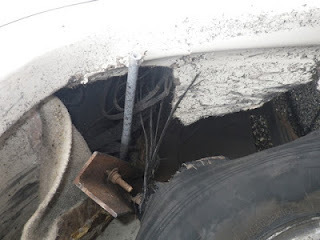 Another owner of an Aero Cruiser had a rear tire fail at speed and it did some horrific damage to both his fiberglass wheel well and much of his interior where the tire carcass tore through it. I figured it would be better if that DIDN'T happen to me! So, off on a quest for new tires. I figured I would gather some information on tires in general and then select a brand and type based upon what I discovered. Remember, do the research THEN buy. Saves time and money. I like that. You probably do too! My RV had Bridgestone LT235/85 R16 Load range "E" tires. These worked very well for me. I traveled all the way from the west coast to the east coast and then from NY to South Carolina on them. Handled well and were smooth on the road. A good combination. First thing to do? Make sure that the tires you are looking at will carry the weight of your RV. What? You don't know what your RV weighs with all your stuff, full tanks and You in it? Not good. Go find a truck weighing station or place that sells gravel or stone by weight and have it weighed! Better yet, see if you can find a place that can tell you the weight at each corner. Next decide if you are happy with your existing tires. How was the ride quality and handling? If it was acceptable and you can find the same tire brand and design in the right/same size for a reasonable price. Buy Them! When I went looking the Model of the tire was no longer available in the size I needed. I called Bridgestone to figure out what to do. Nice folks over there. They spent quite a bit of time explaining all the differences between a Passenger car tire, a Commercial Truck (Delivery and Long-Haul) tire and an RV tire. They are designed a bit differently. I found out that the tires I had were 3 generations old and there were updates that made the newer generations safer, longer lasting and better riding. Sounded good to me! The Duravis R500 was the ticket. The Bridgestone engineer I spoke with let me know that tires should be safe for 10 years, BUT you should have them inspected by a tire professional each year after 7 and junk them after 10. I was long past that. The sad thing? The tires were in fantastic shape. Not really treadworn, no sidewall dry rot or cracking anywhere in the tread. Even inside they looked great. Still, for the under $200 for each tire shipped I figured it was cheap insurance against catastrophic failure. I know many RVs have tires that are MUCH more expensive, but what could happen may be a lot worse. I'm not trying to scare anyone, heck I was running 13 year old tires with no problem at all. I probably could have gotten many more years out of them without a failure. Probably. After you figure out which tires to buy, find a reputable shop that understands tires for heavier vehicles. I used a shop that could spin balance heavier tires up to 80MPH to get a good balance on them and prevent annoying (and possibly dangerous) vibrations at higher speeds. No, I don't cruise at 80MPH, but the balance will give me smooth travel at lowers speeds. Make sure the weights they put on (if any) are securely mounted to the rim. I don't like the stick-on ones...but lots of people swear by them. Balance all four (or six...or 8 etc.) tires. When they are bolted back on your vehicle make sure you know what the torque specification is for your wheels. Usually you can find that in the manual. It will be in "foot pounds, ft/lbs" of Torque. Mine are 140 ft/lbs. each. This will make sure the wheels and tires stay attached and that you aren't damaging the rims when they are installed. After all of them are mounted make sure the tire pressures are set correctly. This will vary based upon the weight you are asking them to carry. Too little and the tire will overheat and possibly fail. Too much and the same thing could happen. Either way and they will wear improperly and put you back in the tire purchasing loop. Your manual should let you know what the pressures should be. Sometimes they are different for the front and back. Mine are set at 65 PSI front and 70 PSI back. That matches the weights I have and the inflation chart the tire manufacturer published. Usually you can find the charts online at the manufacturers site. While the tires and wheels are off, I like to inspect the front and rear suspension and anything else I can see with the tires removed. A couple of years ago I replaced/rebuilt both front and rear suspensions and it's nice to see they are doing well. If you are unsure what to look for ask the tire shop guys. They are usually very helpful. Not always....but usually. By the way, if anyone is looking for some old 235/85 R16 Tires I have 4 of them. They LOOK pretty good! I couldn't agree more. It's always better to be safe, rather than sorry. I'm glad you figured it out early, before extensive damage was done. Good post with some nice info.